Westwide SNOTEL basin-filled map January 29, 2019 via the NRCS. 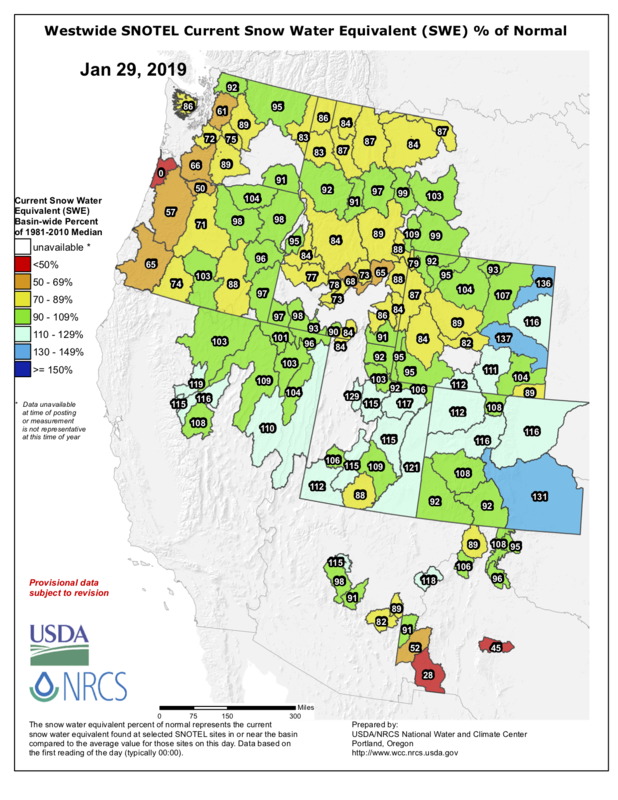 Snowpack in the Yampa and White river basins is at 110 percent of its long-term median snow water equivalency, which is a measure of how much water is contained within the snowpack. Snowpack typically peaks in April, so snowfall — or lack of it — could still force that number away from the median. “I don’t know if there are many communities in Colorado that can say that,” she said in an update to the Steamboat Springs City Council on Jan. 15. One of the ways managers seek to minimize the risk of a compact call is demand management, she said. This is a spot where Steamboat has hit beyond the mark. In 2011, the city’s water conservation plan sought to reduce water consumption by 5 percent, said Michelle Carr, city water and sewer distribution and collection manager. The city exceeded this goal, and as Steamboat’s population has grown, it’s demand for water has fallen, she explained.